Hopefully, you're well prepared for the bitter cold months that lie ahead of us. If not, it's time you start prepping your closet. While your lighter fabric mens clothes may be stylish, it won't do much to keep you warm in the upcoming months. Because of this, you need to ensure you have winter-ready apparel. In this article, we will discuss a few essential pieces of mens clothes you should have in your closet for winter. A parka: A heavy duty, winter-weather ready parka is more than necessary when it comes to choosing winter mens clothes. 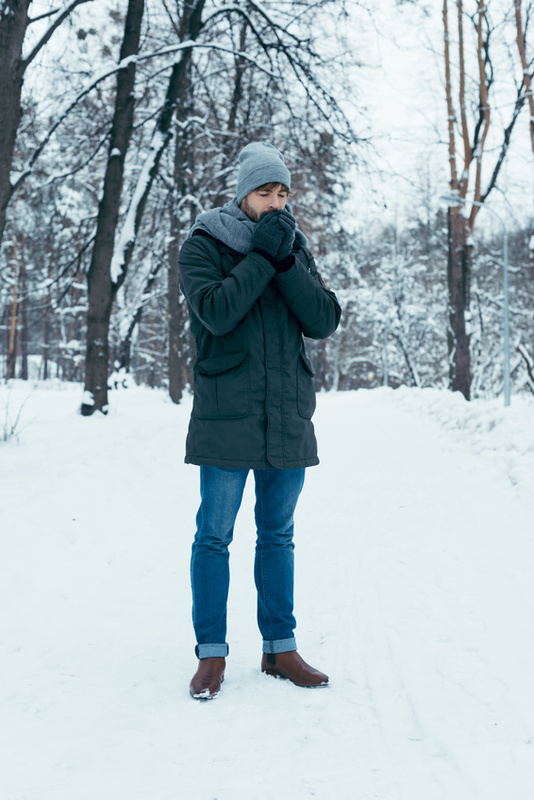 Whether you're walking to the store or darting from your car into a building, you're going to be outside at some point this winter. And when that happens, you shouldn't let the bitter cold make you miserable. With a down-filled parka, you'll barely notice it's cold out. Dark-wash jeans: Just like how the day is staying darker longer, so should your jeans. Dark jeans are perfect for the winter weather and you should consider choosing a heavier fabric as well. A wool hat: Keeping your head and ears warm should be a top priority this winter. By having a wool hat, or even a stylish beanie, on hand is an easy way to ensure your noggin stays toasty even when the temperature hits single digits. Winter boots: If you don't already have a reliable pair of winter boots, it's about time you invest in one. No matter if there's snow, freezing rain, or just plain ice, you should be prepared for whatever the weather decides to throw at you this season. A wool overcoat: While parkas and other jackets are designed to keep you warm, they may not be appropriate to wear with mens dress clothes to work or special events. Because of this, you may want to invest in a wool peacoat or top coat. In fact, 100% wool overcoats are said to be the warmest and most durable. Wool dress coats will not only keep you warm but will also keep you looking stylish when you need to. A heavier suit: If you're winterizing the rest of your closet, you shouldn't leave out your suits. Most mens suits are made with a lighter fabric, making them ideal to wear when the weather is warm. However, you may want to invest in tailored suits for with winter weather. By working with a tailor to design custom suits, you can not only pick out the style and colors, but also the materials. You should consider choosing materials like wool, flannel, or tweed. Even though winter is cold, that doesn't mean you have to sacrifice your sense of style. There are plenty of stylish articles of clothing that will also keep you warm. By simply swapping out your summer styles for heavier-fabric options, you'll be sure to stay warm all winter long. Older PostWinter Clearance Sale Starts Now!